Omikuji are written oracles, obtained by drawing lots in which the good or bad luck of events is indicated through praying at Shinto shrines or Buddhist temples. One's overall fortune, covering various aspects of life such as academics, business, marriage, victory or defeat, can range from outstanding to bad. 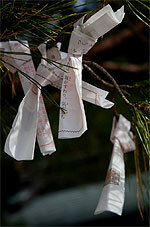 During the New Year, most people visit shrines and enjoy drawing omikuji. However, rather than drawing omokuji to actually know about their fortunes, most people seem to do it just for fun.Omikuji are written on long narrow paper and usually tied to trees in the shrines or temples after being read in the hope that their prayers will be answered. With yakudoshi (unlucky age), there is a great risk of encountering misfortune or spoiling one’s health, so it is the age when one must be careful. The yakudoshi age is determined by adding one year to the actual age, which occurs for men at 25, 42 and 60, and for women at 19 and 33. The ages of 42 for men and 33 for women are considered to be particularly bad years, and are called "great calamity". This may be just a superstition, but because there have been many occasions when these ages have actually corresponded with turning points in people’s health or jobs, many people of those ages go to Shinto shrines for exorcism. 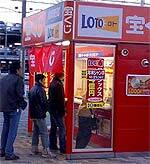 Takarakuji is a public lottery with money as its prize. It resembles the lottery or number games in other countries. 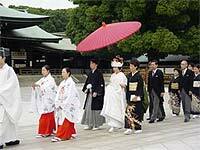 Takarakuji tickets are issued by local self-governing bodies which take the proceeds as a source of revenue. The practice began in the Edo Period (1603-1867) as a lottery sold to provide for reconstruction and repair of Buddhist temples and Shinto shrines. The first Takarakuji was sold at 10 Yen in 1945 by the government. The first prize was 100,000 Yen and other prizes were items like cloth and cigarettes. In those poverty-stricken times, it ignited an explosive popularity. Nowadays, the top prize reaches as much as 300,000,000 Yen. As the prize money is exempted from income tax, the popularity of Takarakuji is so great that tickets are sold on a reservation basis. Seiza (sitting straight) is the proper way to sit on tatami mats and is always practised on formal occasions such as tea ceremonies. Since legs are folded under so that the body rests on the heels, people who are not accustomed to it would probably feel that doing seiza for a long time is painful. However, when doing seiza, the central line of the body from the head down to the spine is perpendicular to the floor, so one can maintain a well-balanced posture. 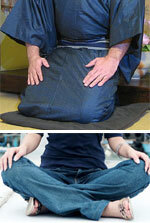 When sitting on tatami mats, it is good for one to sit that way. In contrast to sitting straight, the relaxed way of sitting is agura (sitting cross-legged). Starting with legs out straight and folding them in like triangles is called agura. Men often sit this way, but it is ill-mannered for women to do so. A relaxed sitting posture for women is generally to maintain seiza with knees together but with the feet just off to the side. Pachinko is said to be an improvement on the "Corinth Game" which was brought to Japan from the United States around 1920. It has become a diversion for many people but those under eighteen are prohibited from playing it as it is considered a form of gambling. 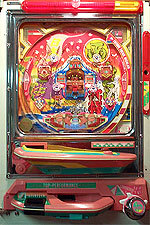 The game involves launching steel balls with a spring flipper and, if they go into the several holes on the game board, 10 or more balls come out. In the past, the balls were flipped manually using the flipper, but now the flipping is done electronically. Accumulated balls can be exchanged for various prizes such as cigarettes or sweets. Contemporary Japanese weddings consist of a mix of traditional and contemporary aspects and are carried out in a variety of ways. There are formal meetings, during which a go-between introduces the man and woman, and the exchanging of betrothal presents, which are gifts of money and goods that the two families exchange as evidence that an engagement exists. There is also the ritual of exchanging nuptial cups during the marriage ceremony in which the bride and groom, using a set of three sake cups, alternately drink sacred sake. The aforementioned are traditional aspects. Holding the ceremony at a specialized wedding hall in accordance with Shinto, Buddhist or Christian rites and going on honeymoon are comparatively recent practices. In wedding ceremonies, there are two essential elements: the ritual ceremony and the wedding reception. Large numbers of friends are invited to the wedding reception, which usually takes place in grand style at hotels. Furin are small bells made of glass, metal or ceramic which are hung from the eaves of houses mainly in summer. A rectangular strip of paper called tanzaku is hung from a clapper and ancient Japanese poems or verses are written on it. 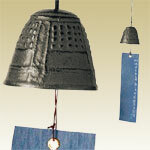 When the tanzaku catches the breeze, the bell chimes. In the hot, humid Japanese summer, the sound of the furin vibrating in the breeze is, for the Japanese, a puff of coolness. Hanabi-taikai (fireworks display) constitutes a typical summer scene. It originated in the Edo Period (1603-1867) with the firework exhibition held competitively between two firework factories, namely Tamaya and Kagiya. In summer, firework displays are held throughout Japan. 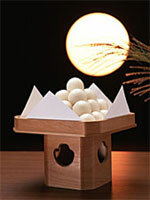 As Japanese summers are hot and humid, the displays are suitable for lively gatherings on nights when one is unable to sleep. The spectacle of fireworks blooming beautifully then disappearing with a pop can be taken as a symbol of graceful resignation or transience like cherry blossoms. In the Orient, there is a custom of appreciating the moon. In Japan, on the night of September 15th, dumplings, Japanese pampas grass and seasonal fruits are placed by the windows and offered to the moon. The full moon in the clear autumn sky appears especially beautiful, but the prototype of moon-viewing for the Japanese, who are a farming people, is to liken the moon to a divinity to whom they pray for abundant harvests of rice. That is currently how moon-viewing is generally observed. The national flag of Japan has a red circle on a white background. "Nippon" (Japan) basically means "land of the rising sun” so the red circle is a symbol of the rising sun. Just as the British flag is called “the Union Jack” and the American flag "the Stars and Stripes,” the Japanese flag is called “Hinomaru”. This red circle of Hinomaru is used independently as all kinds of symbols. There are people who do not think that Hinomaru is appropriate as the national flag of Japan because it was also used as a symbol to represent the "suicide units" and other tragedies in the Second World War, and thus it is connected to unfortunate memories of the war. Torinoichi is a festival that is held at Shinto shrines on set days in November and is also called “Honorable Rooster” (otorisama). 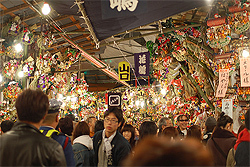 Originally, it was held at Otori Jinja (Otori shrine) to honour the gods of luck and business prosperity, but now it is held at other shrines too. Festival days occur two or three times in November and are known as the “First Rooster”, “Second Rooster” and “Third Rooster” respectively. On those days, lots of street stalls selling, among other things, bamboo rakes as good luck charms are set up in the shrine compound. This is a national holiday to celebrate the birth of the Emperor, who is a symbol of Japan and a symbol of the unity of the Japanese people. 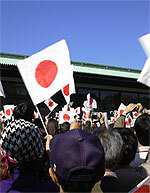 Since the first year of the Heisei Period (1989), it has occurred on December 23rd, the current Emperor’s birthday. The day is marked by banquets at the Imperial Palace, to which Cabinet ministers are invited, and tea ceremonies to which foreign ambassadors and officials are invited. Many people visit the Imperial Palace, and the Emperor and the Imperial family stand on the balcony of the Imperial Palace to greet those who come to offer congratulations.